The leaf blade of biennial herbaceous plant Isatis indigotica Fort. of family Cruciferae. Jiangsu, Anhui, Hehei, Henan provinces, etc. of China. . Planted in winter and collected twice or three times in summer and autumn. Light smell, slightly sour, bitter and astringent taste. 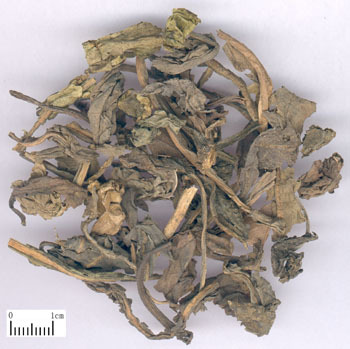 Dried, big and complete leaf, dark gray green in color, without impurity such as branch, stem. Bitter, pretty cold; lung, stomach, heart and liver meridians entered. Clear heat and remove toxicity, cool blood and remove macula. With the property of bitter and extremely cold, it has a much stronger action of clearing heat and cooling blood. It can clear heat and purge fire when entering qi system, and cool blood and remove macula when entering blood system, so it is commonly indicated for any stage of warm diseases and external contraction of wind-heat. For initial warm diseases when the pathogens stay in defense system, or external contraction of wind-heat manifested as fever, headache, thirst and sore throat, it should be combined with wind-heat-dispersing herbs, as in Qing Wen Jie Du Wan from Pharmacopoeia of the People's Republic of China published in 2000, Ge Gen, Niu Bang Zi and Chai Hu are used in combination to take effects of releasing both the exterior and interior simultanously. For warm disease in stage of heat entering blood, or dual blazing of both qi and blood which is manifested by high fever, coma, macula and papules, it is preferred because of its prominent actions of purging fire and removing toxicity, cooling blood and removing macula. Usually it is combined with heat-clearing and blood-cooling herbs to clear heat from both qi and blood systems, as in Da Qing Tang from Zheng Zhi Zhun Sheng, Xuan Shen and Sheng Di are used in combination. Because it is good at clearing heat-toxicity in blood system from both heart and stomach meridians, it can take effect of removing toxicity and alleviating sore throat, cooling blood and removing macula, and curing abscess and dissipate nodulation. For red swollen and sore throat caused by wind-heat or heat-toxicity accumulation, it can be used singly, for example, its pounded juice is taken, as recorded in Wei Sheng Yi Jian Fang (Simple Prescriptions for Public Health); and it is also usually combined with heat-clearing and toxicity-removing herbs or wind-heat-dispersing herbs, such as Zhi Zi and Huang Qin were used together in Da Qing San from Tai Ping Sheng Hui Fang. For mouth ulcer due to heat-toxicity, it is often combined with herbs specialized in clearing heat-toxicity from heart and stomach meridians. For example, Sheng Ma, Da Huang and Sheng Di Huang are combined in Da Qing Tang from Sheng Ji Zong Lu. For erysipelas, it is used singly in Ben Cao Hui Yan. For sores and abscess with swelling pain due to blood heat and excessive toxicity, it is usually combined with Jin Yin Hua, Pu Gong Ying and Zi Hua Di Ding for either oral or topical administration. In addition, it is also indicated for bleeding syndrome due to blood heat for it has the actions of cooling blood; since it has the actions of clearing heat from lung, stomach and liver, it can also be used in treating cough due to lung heat, jaundice due to liver heat, and diarrhea and dysentery due to stomach heat. Decoct 10~15g. Proper dosage is for topical administration.